Ages 5 through 10. This downloadable 32 page product includes reproducible worksheets pages that can be used with any speech sound. The lessons promote the development of speech, language, and thinking skills as students create stories, give descriptive information, and solve problems. The tasks help students to generalize the skills learned so that they can produce the target sound consistently in a variety of contexts. 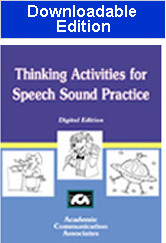 This product includes reproducible activity worksheets with space for recording students' responses. It also includes reproducible playing cards. Ask each student to select a card and to do the activity described on that card. Students who are working on different sounds can be grouped together for this activity. The worksheet activities in this publication can be presented by speech-language pathologists, claslsroom teachers, or by family members.